DO YOU WANT A STRONGER SPEAKING/TRAINING BUSINESS? Following the Academy Intensive in July, we are excited to bring you Academy Intensive Advanced! Your hands on workshop to boost your speaking business and get you more momentum. As well as identifying opportunities and the practical to do’s of running a speaking business. This training is the chance to apply teachings directly into your business, and to come out with specific plans and steps to success. To ensure the maximum value and outcomes, this event is only open to 12 people, so first in first served. Participants MUST have completed a previous Academy Intensive to attend, and minimum numbers are required to run the event. 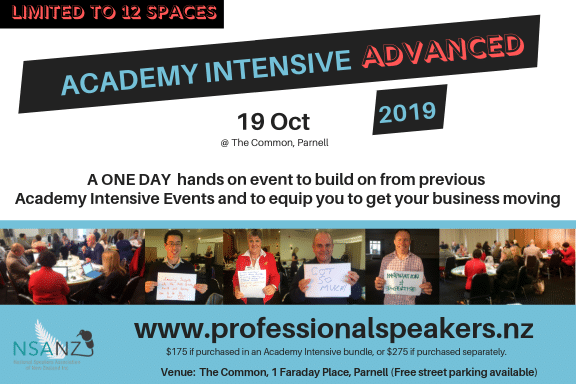 Book online today and you can also choose an Academy Intensive bundle, by registering for both events together at this link.